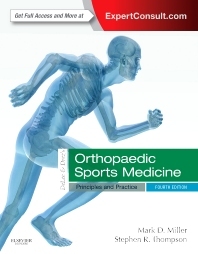 The revised, streamlined, and reorganized DeLee DrezÂ’s Orthopaedic Sports Medicine continues to be your must-have orthopaedics reference, covering the surgical, medical, and rehabilitation/injury prevention topics related to athletic injuries and chronic conditions. Offered as a 2-volume set, it provides the most clinically focused, comprehensive guidance available in any single source, with contributions from the most respected authorities in the field. Be prepared to handle the full range of clinical challenges with coverage of both pediatric and aging athletes; important non-orthopaedic conditions involved in the management of the athlete; rapidly evolving techniques; and sports-related fractures. Understand rehabilitation and other therapeutic modalities in the context of return to play. Take advantage of in-depth coverage of arthroscopic techniques, including ACL reconstruction, allograft cartilage transplantation, rotator cuff repair, and complications in athletes, as well as injury prevention, nutrition, pharmacology, and psychology in sports.